Although, we have been members at Faith Lutheran Church since Samantha was a baby and still love that Church, we started attending Christ Church of the Valley ( CCV) a couple of years ago because of their large young adult groups. I had been praying for a way to create a new social life for Samantha. She was quickly recognized by a sweet girl that had a mutual friend and invited to join their small group that was meeting weekly. This was her first "new" group since her accident and the experience was incredibly freeing. Girls all her age that didn't know her before, so incredibly supportive and so wonderfully accepting with who she is today. She finally had a place she could go hang out with girls again and the fact that they had Jesus as the center was the icing on the cake for me. Athalie's small life group was the answer to my prayers at that time. 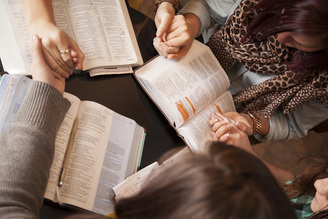 Recently, Samantha and one of her assistants recently started attending CCV's women's Bible study on Tuesday evenings. This weekly activity really reinforces her faith, love, and presence of God in her life. And is another opportunity to see the new friends she has made since joining this amazing church. FLC in San Dimas and Pastor David Berkedal was the key in helping me to accept the gift of faith years ago, that the Holy Spirit offers anyone who is seeking. I learned so much from listening to his sermons through the years. He's a very interesting speaker and a true professional when it comes to on-the-spot prayers! He is what helped to keep me grounded in a "real" faith during our time of incredible need. He, The Reverend Sally Welch and the congregation as a whole will always hold a special place in my heart for the love and support they offered through this difficult time. She and I both know and feel God's presence in our daily lives, even if she isn't restored 100% to her pre-accident perfection. It's not because my faith was any less, or that we didn't pray hard enough, or for any shortcoming on our parts here. Just because someone believes in God, prays passionately about something and claims that victory ahead of time doesn't make it magically happen. We simply don't control God or the Universe in that manner. Prayer is not a tool to get what you want in this lifetime. It is so many things, most importantly it is a conversation between you and a loving heavenly Father, that listens, cares and promises to always be there to help you through the tough times. God doesn't promise to give you all that you ask for. I believe He actually hopes that we each will help each other find the means to heal, restore, help, feed, teach and provide for His people during our short stay on Earth. He doesn't wave a magic wand and make things happen here, but rely's on those of us who allow Him to live in our hearts to make a difference in the world around us. With His help, all things are possible. Indeed, there have been countless people that have come into our lives and were the source of strength, knowledge, medical expertise, surgical skill, resources, love, joy, hope, inspiration.....all things that have contributed to our ability to wake up each day and put one foot in front of the other to keep going. To keep working at restoring a life not just for Samantha, but for our entire family that has been affected by her injuries. These people have felt like real angels. They had no idea that I could see angel wings on their backs and halo's glowing above their heads. They were simply being themselves, sharing selflessly because God lives within them. We are eternally grateful to the angels God has surrounded us with. Our faith is a vital part of helping me to keep my sanity and overcome this incredibly difficult situation life threw our way. It is the reason our family is still intact and is crucial to helping Samantha stay strong!